Security at the docks, at the factory, in storage facilities, and in distribution environments has become an increasing concern. This section presents warehouse security articles, tips and information to help you make your operation safer, more secure, and more effective. We also offer a number of tips and links to informative data, worker compensation issues, safety programs and information in our award-winning Warehousing Insights Blog's industrial security area. When it comes to warehouse thievery, employees are most often than not the culprit. There are preventative measures you can take to limit or even put an end to your inventory walking out the door. Where you place critical elements such as bathrooms, doors, and inventory can enhance your facility's security and prevent theft, pilferage and other security violations. Arranging your operation correctly can enhance not only security, but many other aspects, including order picking speed, safety, and productivity. The way you store and handle inventory is critical to its security, especially in a warehousing or production operation. The more organized your storage systems are, the more secure your inventory, tools, parts, and equipment. Physical Datacenter Security: "Most Overlooked"
Vandalism or accidental damage can also occur when servers, computers, or other equipment is left exposed to unauthorized personnel. A lockable room or security barrier is relatively inexpensive and can pay large dividends - yet many information technology security experts overlook this vulnerability. In today's privacy-driven environment, financial institutions are working harder than ever to ensure confidential client information. One way to achieve this is through secure storage areas for these sensitive records. This guide outlines the methods and equipment to guard paper records, servers, and other critical physical documents or IT equipment. Almost any warehouse has something people want, and will steal. Electronics, tools, footwear, clothing, prescription drugs, computers, jewelry, tobacco, and media especially coveted, but nearly anything can be at risk from industrial components to glassware. 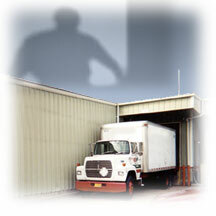 The shipping and receiving docks are the weak point in most operations' security. Here's how you can deter theft at the docks. Tenant Lockers - Which Type Works for You? Tenant storage for apartments, condominiums, business malls, residential or commercial buildings is available through a number of storage media, ranging from bulk lockers to cages. This guide lets you know the advantages and limitations of each of your options. We provide both heavy duty woven and welded wire partitions. What are the functional differences? This article provides you the information needed to understand which type of security partition might best fit your needs.